But a recent decision by the European Court of Justice (ECJ) tries to do just that, make the internet forget, because, according to the Court, everyone has the right to be forgotten. Here’s what happened: In 1998, the Barcelona newspaper La Vanguardia carried an official announcement, in print and in its online edition, that real estate owned by Mario Costeja González had been seized and would be auctioned off to settle his debts. Eleven years later, Costeja González found that anyone searching for him on Google would be directed to that announcement, so he sued La Vanguardia and Google Spain to remove the information and any links to it. He claimed that the announcement of the debt sale was no longer relevant and could be prejudicial to his present interests (Google Spain SL and Google v. Agencia Española de Protección de Datos [AEPD] and Mario Costeja González [C-132/12]). Detail from the Jan. 19, 1998, edition of La Vanguardia, announcing the debt auction. Translation: The two halves of a duplex at 8 Montseny St., property of Mario Costeja González and Alicia Vargas Cots, respectively. Area: 90 sq. meters. 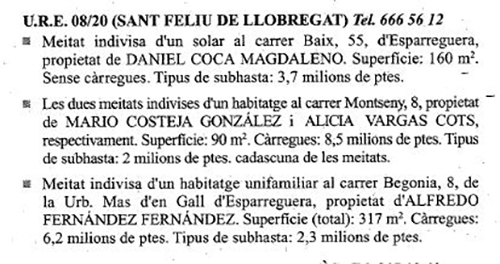 Mortgage: 8.5 million pesetas. Minimum bid, 2.3 million pesetas per unit. That’s about $25,000 each in today’s dollars. the [individual’s] right to object at any time, on compelling legitimate grounds relating to his particular situation, to the processing of data relating to him, save where otherwise provided by national legislation. The Court found that putting information online and retrieving it with a search engine each constituted "the processing of data," as defined by law. It acknowledged the newspaper's right to keep the debt auction notice in its online archive, because journalism is protected speech, but it ruled that Google must take down its link to that notice, making information from the news archive much harder to find. In the opinion of the Court, search engines must now respond to any justified request by removing the offending links even if the information that they link to is true. 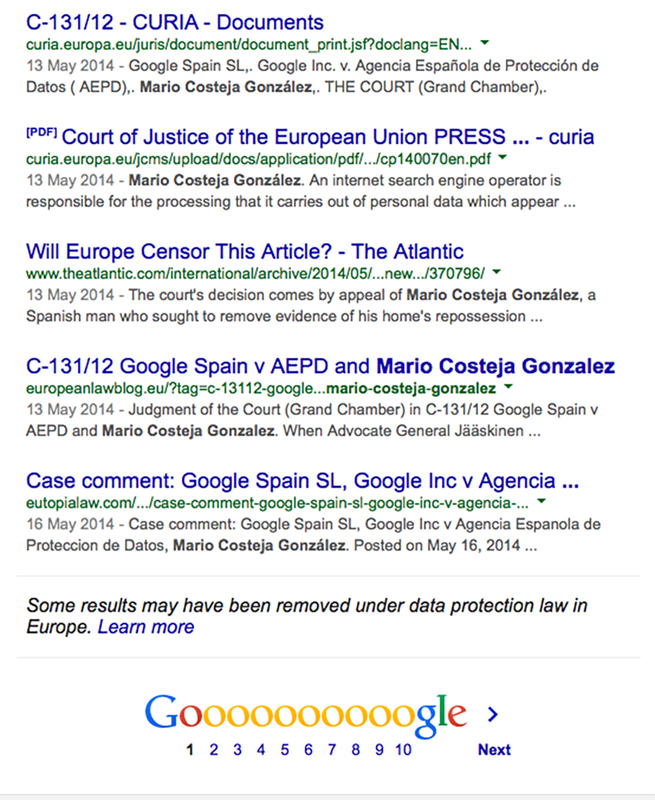 Above: Third screen of a google.com search for Mario Costeja González from the U.S. Below: screen shot of the same search done via a European search engine. 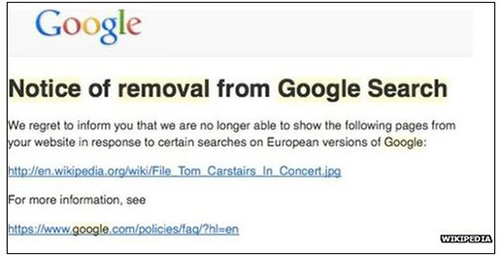 Notice of removal from Google Search: We regret to inform you that we are no longer able to show the following pages from your website in response to searches on European versions of Google. After a list of affected links, Google directs users to a page explaining the policy. In its decision, the European Court of Justice made it clear that not every request to be forgotten deserves to be honored, that removing data must be done on a case-by-case basis. This imposition of selective forgetting threatens to swamp Google and other data uploaders with frivolous take-down requests. Google v. Costeja González represents a sweeping defense of internet privacy, but it's also a blow to free speech online. To complicate matters still further, the European Commission has drafted a new General Data Protection Regulation, on track for adoption later this year, that will take what is now an implied “right to be forgotten" and encode a new "right to be forgotten and to erasure" into EU law. Adding "erasure" to the right to be forgotten would allow people to request deletion not just of links to information about them, but also the information itself. Google would have to delete the link to a newspaper notice of a debt auction, and the newspaper would have to delete that notice from its online archive. The right to get your data erased is not absolute and has clear limits. . . . A case-by-case assessment will be needed. Neither the right to the protection of personal data nor the right to freedom of expression are absolute rights. A fair balance should be sought between the legitimate interest of internet users and the person’s fundamental rights. Freedom of expression carries with it responsibilities and has limits both in the online and offline world. The right to be forgotten is certainly not about making prominent people less prominent or making criminals less criminal. But a fact sheet is not a court of law, nor can it predict how government agencies or commercial enterprises like Google will decide, case by case, the many deletion requests that they’re already receiving in the wake of the “right to be forgotten” decision. Less than three months after the ECJ ruling, Google had processed more than 91,000 requests to remove some 328,000 links, and it had complied with about half of them. The European Commission envisions that every information uploader--whether government agency, big business, or individual blogger--will form a panel of highly-trained experts to thoughtfully adjudicate requests for erasure. But the sheer weight of the task means we won't see an even-handed and uniform application of European law for each request, but batch processing based on random, ad hoc decisions by low-level clerks or civil servants about what information is out-of-date, or prejudicial, or a matter of public interest, or protected by artistic or journalistic freedom. On Tuesday alone, 840 articles in the world’s largest media outlets were written in reference to his case, including in countries where his name would otherwise never have been heard, and where the ECJ’s ruling will never reach. 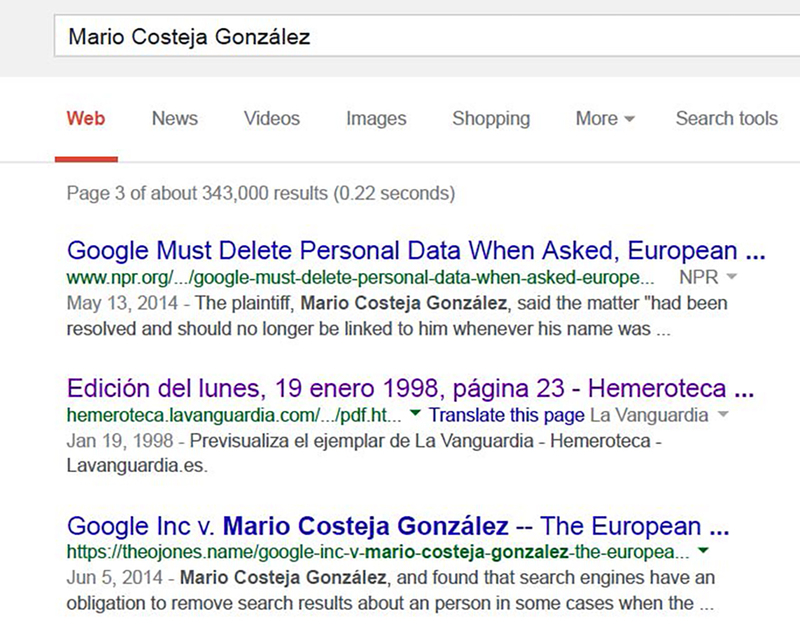 Costeja González will now be known both as a debtor and as the man who sued Google and won. His only chances for oblivion are to ask Google to take down all the links to his lawsuit as well, or to hope that his name is among the eighty-five percent of internet content that will disappear within a year. Or he could change his name.